Microsoft rolled out Outlook.com recently and it’s slated to eventually replace the aging and reputation-challenged Hotmail service. For now, users can choose to upgrade or not, but eventually it will become required. Microsoft has built a lot of new features into this web mail client, not to mention lending it the hallowed “Outlook” name. One of the coolest new features is the ability to connect with other services like Facebook, Twitter, Google, and more. To get started with this you will actually need to visit your Microsoft account (formerly known as a Windows Live account). Here you can click the “Add accounts” option from the left menu bar. This will take you to a screen that displays available accounts to connect with. Those already connected can be found under “Manage your accounts”. Click on the service you want to access in Outlook.com then choose the “Connect” button. In this example I was connecting with a Google account and I was taken to a Google page where I was asked if I wanted to allow Microsoft access to manage my contacts. Click “Done” and that’s all there is to it. Now access the “Manage your accounts” to view connected accounts and makes changes to each via the “Edit” option. 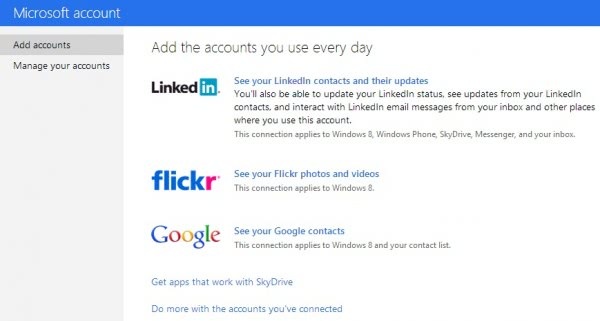 Currently there are options for Google, Facebook, Twitter, LinkedIn, and Flickr. Depending on the service you get access to your contacts, notifications or files once you have connected the accounts. 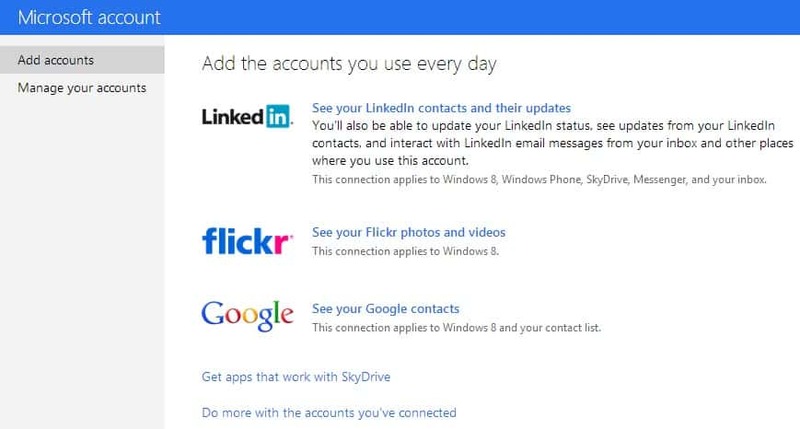 If you haven’t signed up yet for an account, you can visit Outlook.com. If you don’t want to change your email address and loosing access to everything you have previously used your current address for, then you can create a “name@outlook.com” alias and still receive messages to your previous address.